Your safety is of the utmost importance to Route 15 Used Car Center. That's why we're introducing the Chevy Equinox. 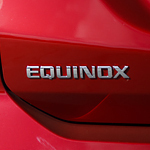 The Equinox is a compact SUV that has the technology to keep you safe on the road. New camera technologies have changed the game when it comes to driving safety. Tailgating is a leading cause of accidents, and we've all done it. The Adaptive Cruise Control Camera in the Chevy Equinox makes sure you never tailgate again. You can even select the distance you'd like to keep between you and other vehicles. The cruise control adapts to your preferences over time. An adaptive cruise control system also reduces wear and tear on your Equinox. Traveling in reverse is easier with the Chevy Equinox. The Equinox displays images from your rear vision camera directly on the dashboard infotainment system. You'll be able to park in the tightest of parking spots without getting into a fender bender!